In picturesque Mountcharles on a crisp July morning, former Fine Gael politician, Colm Gallagher, was buried with an attendance that came from having been a political mover and shaker for years, the sort of figure that brought two national party conferences to the area. Former ministers, old Council colleagues and a lifetime of contacts mixed with local people coming to pay their respects. In politics, it was a suitable ending to a long and distinguished career. It defied Enoch Powell’s infamous adage that ‘all political lives, unless they are cut off in midstream at a happy juncture, end in failure, because that is the nature of politics and of human affairs’. 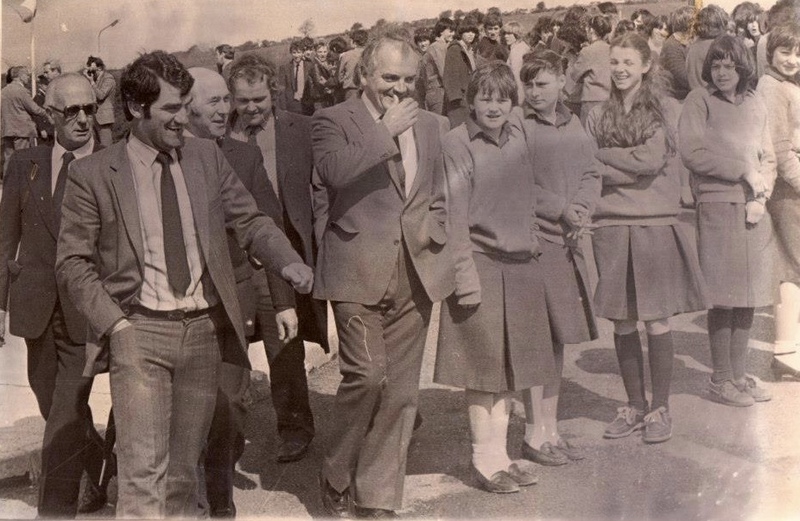 His death reminded me of the photograph above of him in his prime back in 1982 when he was Chairman of Donegal County Council and the VEC and about to open the Abbey Vocational School in Donegal Town. 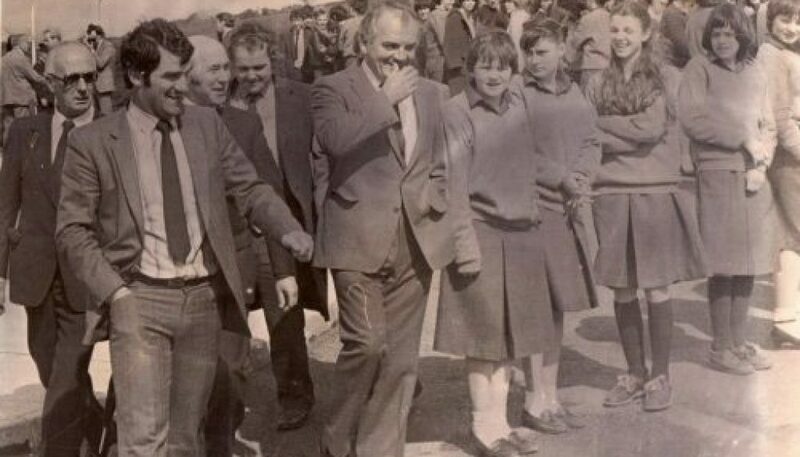 Rounding the corner from the Ballyshannon Road facing the main building itself, all of the dignitaries in the picture are in good form as they share a joke. Handsome, confident, well-built men from the north west of Ireland. Colm, with Danny Ocean-like insouciance, leads the charge with a swaggering Clement Coughlan on the left; think Reservoir Dogs meets Ocean’s Eleven with a bit of Bracken thrown in for good measure. Right beside them are a number of female students from the town – a deadpan Elaine Curristian, an enquiring Maria McHugh and a giddy Kathy Breslin, the cause of the men’s mirth I reckon as she’d have known them all from time served in the nearby family-owned Abbey Hotel, somewhat ironically as you’ll soon read. I’d reason to go looking for the photo recently when Kathy turned 50 and it served as the cover of the birthday card I sent her. Beyond its comedic value, its richness as a portal to another time and its historical redolence struck me. This was one hell of a photo. It captured a big moment in the life of the Donegal Bay area; finally, after years of prefabs and delays, the opening of a brand spanking new school for a catchment area as far south as Ballintra, out to Barnesmore and all the way to Inver was happening and this was that far off day. All things considered, as a politician, this was as good as it got and they were rightly basking in the moment on the home straight to the new school, a sunny day full of celebration, of bunting, speeches and photographs, of knowing that this was the sort of milestone that people remember you for at the ballot box. Groove Armada: play it loud and proud. From the left, we have fixer and Fianna Fail apparatchik, Andy Brogan, Deputy Clement Coughlan, Minister Martin O’Donoghue, Bernard Kelly, one of the well-known Kelly clan and Cathaoireleach Colm Gallagher. July 2018 saw the passing of Colm Gallagher and Professor O’Donoghue leaving Bernard as the last men standing. In terms of ‘numbers being up’, O’Donoghue’s short six month tenure as Minister of Education had just over a month to run before being unceremoniously sacked by Charlie Haughey on the 6th of October 1982. With the country on its knees, this opening was definitely one of the better days of his ministry. Despite being probably the best qualified person to hold the office since the State was founded, he was to lose out on purely political grounds. O’Donoghue was from the pesky anti-Haughey wing of the Fianna Fail party. Along with Dessie O’Malley and Bobby Molloy, they had had just about enough of Charlie’s GUBU shenanigans in the preceding months. Problem was that Charlie was tired of their antics too and out on his ear he went with Dessie from the Cabinet. Unbeknownst to all protagonists in the photo, this picture serves as the calm before the storm. On the surface, it appears as a big day in a provincial town, but it also stands as a pivotal picture from the summer of 1982, weeks after Italy’s win at the World Cup and just days before Seamus Darby’s famous goal in the All Ireland final, a photo where two of its participants would go on to play an indirect role in recent Irish history. By the following Spring, there’d be a new government, the third in eighteen months and the protagonists’ regrouping was in considerably more sombre circumstances; a political life cut off in midstream, but not at a happy juncture. Kingdom conquerer: winning by a point. In order to understand the fatalistic nature of Mary Coughlan’s rise, you have to go back to a cold February morning a quarter of a century ago when, strangely, the Dublin establishment came to Frosses. The occasion was for the funeral of her uncle, Clement Coughlan. The TD was on his way to the Dáil when the familiar Irish tragedy struck: a bad stretch of road down the Midlands, a lorry rumbling the other way. His niece was a boarder in the Ursuline convent in Sligo when the news broke that Monday lunchtime – February 1st, 1983. They say all politics is local. The story of the Gillespie sisters from Bunbeg and Haughey’s kicking Coughlan’s concerns of their plight into the long grass may give a hint of what might have played out, but then again, ‘who knows?’ as the former Tánaiste stated. What is known is that prior to Clement’s sudden death, most agree that Haughey was certain to lose that no confidence vote. The funeral bought him time and ever resourceful, Charlie made the most of it and lived to fight another day. ‘Opportunity often comes disguised in the form of misfortune, or temporary defeat’ wrote Napoleon Hill. In the week that saw Shergar disappear, Haughey was being made an offer from the Gods that he couldn’t refuse. After the woeful concatenation of events from the GUBU days of ’82, Haughey didn’t need to think twice on what to do here. Eventually the chickens came home to roost for Haughey with O’Donoghue and his ilk settling scores as the Progressive Democrats years later. For their continued support as governmental partners, they forced him to sack his Tánaiste, Brian Lenihan Senior, during the Presidential election of 1990 and when his erstwhile Justice Minister, Sean Doherty, claimed on Nighthawks that Haughey knew all along about the phone taping from those heady GUBU days of 1982, his own political ‘number was up’. Haughey’s political demise was less the service sentiment from Othello and more the detritus of Enoch Powell’s forecast in nature. 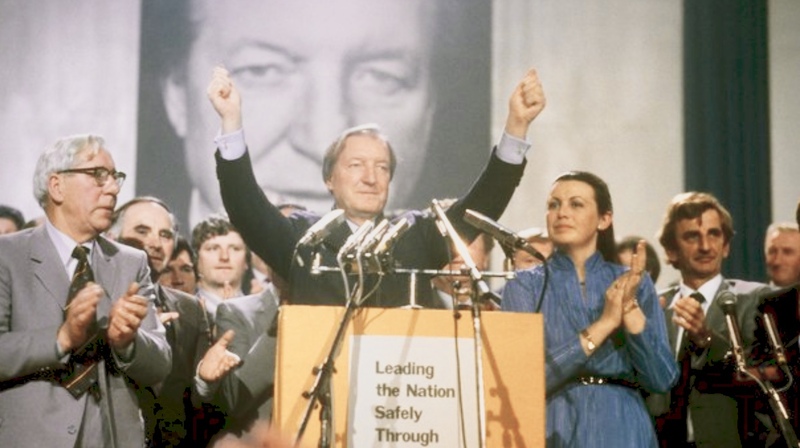 Phone tapping, bully boy tactics and doing backroom deals at someone’s funeral sound like the nefarious deeds of Francis Underwood, but in Haughey’s world, it was par for the course. Bookending the poultry motif, a celebrated Laghey man chucked an egg from 50 feet and it hit Haughey slap bang on the face around about that time – a portent of things to come? Take note of the ‘Road Warriors’ in the background. This too was as good as it got for the local students – like some giant game of Pinball, they’d endured years of traipsing around eight venues in the town to get an education. Eight: Ard Scoil na gCeithre Máistri, The Technical School, the Clubrooms at Water Street, The Pavesi Ballroom/St. John Bosco Centre, at basement rooms in the Methodist Church, rooms at the Presbyterian Church, the Four Masters Cinema rooms and also at a small garage on the Clar Road. Like the nearby golf course in Narin with cows on the fairways of Farmer Boyle’s lands, it is another reminder that those were different times. No more nomadic wanderings – this was the day when the State finally gave them a school that wouldn’t mean a 10 minute hike between Maths and English. 10 minutes by the time stop offs in Eileen’s, Uncle Larry’s, Pearly’s, Sally’s, Quinn’s, Mullin’s and The Scotsman were taken into account. How they’d a tooth left in their head is anyone’s guess. Back then, they could even buy single cigarettes! Gaming, such as the term could be used back then, was confined to the likes of Centipede or Pacman in Paul’s or Duffy’s; Play Stations and mobile phones were far off concepts and style was in short supply as those skirts will confirm. Teens were automatically programmed to retain and remember details, be it song lyrics or cool facts about that new DeLorean in Belfast because Google and broadband were years away. And yet with ‘The Eye of Tiger’ and ‘Come on Eileen‘ as the big tunes of the summer and E.T. and Bladerunner on in the local cinema, they were part of a year, and in time a decade, that is now regarded with nostalgic envy and wonder. If you remember these, you’re ancient! It was the best of times, it was the worst of times: for every chart-topping ‘Don’t you want me, baby?, ”Do you really want to hurt me?‘ or ‘A town called Malice‘ there was a ‘Seven Tears‘, ‘I’ve never been to me‘ and a ‘Save your love‘ back in ’82. Never-ending electioneering, late night phone calls to the Áras, Scalextric, the triumphant Ollie Campbell, the gorgeous Morgan Fairchild, the unstoppable Hurricane Higgins, First Blood, Beirut, Dig Dug, Kids from Fame, Knight Rider, The Black Adder, CND, Solidarity, Thriller, the ‘Big Snow‘, the Stones at Slane, the dire Duskeys, Princess Grace’s death, the first sighting of Wham!, the last sighting of ABBA, Stockton’s Wing’s Beautiful Affair, Philo’s Old Town, the swirling, curling list goes on in recalling that tumultuous year. The photographer was an art teacher at the school, one Mr. Seoirse O’Dochartaigh. Seoirse felt the brunt of politics, well school politics at any rate. With some clear differences between himself and then headmaster, J.J. Harvey, Seoirse took early retirement and has flourished since in Inishowen as a painter, writer, musician, researcher, genealogist and general polymath. He helped me no end as the director of a radio series up there. Away from JJ’s dour gaze, the man thrived; what you might call the ‘Seoirse Redemption’. That he had the eye to see that moment coming along is no real surprise. A good photograph captures a moment that is gone forever, one that is impossible to reproduce. In that fleeting nano-second, those suave gents, as well as Kathy and co., have been frozen in time in their prime. Against the backdrop of high tensions across the border some 13 miles away, of the Falklands some 13,000 miles away, a host of memories and tunes come flooding back; we look at that photo now with hindsight in assessing its place, its time, its people. Back then it was just men laughing and strolling on a sunny day. As Warhol said, ‘the best thing about a picture is that it never changes, even when the people in it do’.